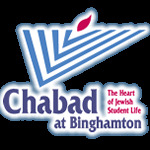 While the primary focus of Chabad is the large population of Jewish students at Binghamton University, The Chabad Center is open to all members of the Broome County Jewish community. There is no membership fee, nor is prior background or experience in Jewish life necessary. Chabad offers an extensive schedule of weekly classes on a variety of topics, presented on multiple levels. Private tutorials are offered as well. Chabad is an affiliate of the prestigious Jewish Learning Institute and offers three semesters of JLI university level Judaic classes annually.Chabad is many things to many people, but for all it is a warm, open and welcoming environment where Jewish education, enrichment and joy is the priority. Chabad sponsors lectures and open forums featuring noted speakers and authorities in diverse fields of interest. On occasion, Chabad brings quality Jewish entertainment, artists and personalities to the area. Chabad is also the sponsor of the prestigious Pauline Piaker Memorial lecture. Additionally, Chabad maintains a well stocked library of Jewish books, tapes and DVD’s; the resource serves both the casual browser as well as the serious researcher. Chabad has a well-stocked Jewish book shop and Judaica store , and can special-order any item from tefillin and tallit to tapes, CDs and toys with Jewish themes. Chabad sponsors community wide holiday celebrations such as dinners in the sukkah; a Chanukah Gala in the Oakdale Mall; a Purim Feast that features ethnic food, live music and entertainment; and Passover Seders. The Chabad staff provide counseling, referrals and pastoral advice, as well as guidance in religious matters and life cycle events. Chabad offers assistance by kashering kitchens, affixing kosher mezuzot and providing the necessary instruction and physical resources necessary to enhance Jewish observance. The Women's League for Chabad offers special programming geared toward strengthening Jewish women's spirituality and education. It is the sponsor of the annual Salute to Jewish Womanhood; maintains the Power of Prayer women's group, a network of women who recite psalms daily for those in need; and offers a local and national shalach manot service for the Purim holiday. The Chabad Mitzvah Corps visits sick patients in area hospitals each Friday before Shabbat. Residents in area nursing homes enjoy Chabad-sponsored holiday programming before or on each Jewish holiday and regular visits. Chabad publishes the Hakesher Magazine , an informative Jewish newspaper, and sends it free of charge to community members. Other educational offerings include the Jewish Art Calendar and a weekly Torah thought that is faxed or e-mailed to homes and offices. In sum, Chabad is many things to many people, but for all it is a warm, open and welcoming environment where Jewish education, enrichment and joy is the priority. Please find a number of links below with more inforamtion on the various services we offer, as well as some pictures from our latest community events. Over 75 members of the Binghamton community enjoyed the Fall JLI course titled :Fascinating Facts; the Myths and Mysteries of Judaism. The growing local JLI community of learners is a small part of a world wide phenomenon that includes thousands of individuals in over 350 locations. Very little can rival the enjoyment of creating one's challah from scratch unless it's the gratification that comes from knowing that one of those Challahs will go to someone whose day-- and life-- will be brightened by the gesture. And those uniquely designed Loaves of Love aprons were the cherry on top of a perfect -- and delicious -- program. In the face of the floods, the annual Piaker Memorial Lecture had to be rescheduled. Despite the short notice almost 100 people gathered to hear Avraham Cohen, brother of Eli Cohen, Israel's most famous spy, tell of his brother's life and times. Before Mr. Cohen's remarks, the documentary, Undercover in Damascus was screened. The young and young at heart enjoyed the Build Your Own Purim Feast Shindig at Chabad. An all pervasive feeling of joy and community filled the room as participants enjoyed the food stations, the music, the dancing, the Hamantashen baking, mask decorating and very popular parade of children in costume. Purim celebrated together; it doesn't get better!